South African rugby is today celebrating the 20th anniversary of the historic 1995 Rugby World Cup win which played such a part in uniting the country and making people aware of the power of sport. 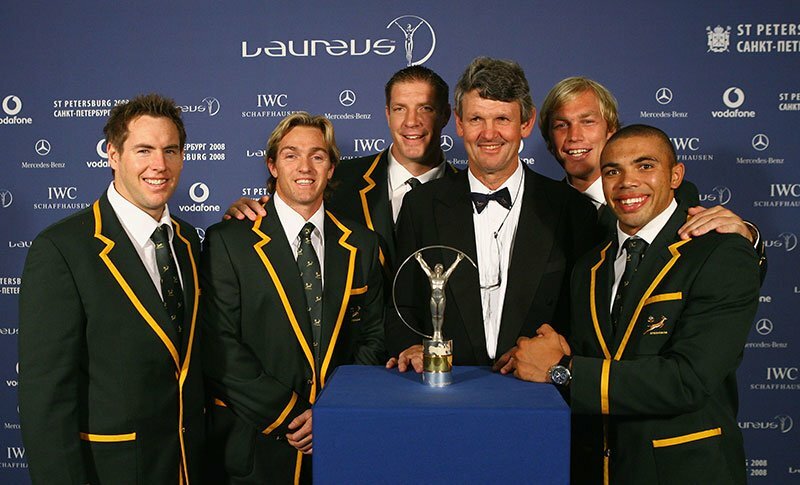 Laureus World Sports Academy Member and rugby legend Morné du Plessis, manager of the winning Springbok side, recalls: “This was the classic example of how sport can change the world. It certainly changed our country and had a lasting effect on how people could use sport to value each other and come to understand each other a little better. South Africa won the Rugby World Cup Final 15-12 against the All Blacks, whose captain was another Laureus Academy Member, Sean Fitzpatrick. It was the first major sporting event to take place in South Africa following the end of apartheid and it proved to be a catalyst in bringing the rainbow nation together. Nelson Mandela, the President of South Africa, wearing a Springboks rugby shirt and cap, famously presented the Webb Ellis Cup to the South African captain François Pienaar, after the match in Ellis Park, Johannesburg. At what point did du Plessis and his Springbok team-mates think they could win? “It came slowly. When we actually arrived for the first match at Newlands [Cape Town] it was just the most incredible sense of anticipation. People were happy and were proud of their country and the players could actually feel that. “The players walked around and got that atmosphere and that really was just something unbelievably special and I think that started the realisation for the team that this was a special event. This was a special moment. This was this was more than just rugby and so it grew through the tournament. This became the philosophy of Laureus; the driving force behind its work and behind the creation of the Laureus Sport for Good Foundation. Now the Laureus Sport for Good Foundation uses the inspirational power of sport to improve the lives of young people, not just in South Africa but around the world. Since its inception in 2000 Laureus has raised €60 million and helped millions of young people. The Laureus World Sports Academy is a unique association of 52 of the greatest living sporting legends, including Morné du Plessis, who volunteer their time to support the work of the Foundation. Laureus currently supports more than 150 community projects in 35 countries, promoting the positive effect that sport has in tackling some of the world’s most challenging social issues from mental health, HIV/Aids, substance abuse, juvenile crime, discrimination and gender equality.